JMT intends to meet the requirements and expectations of its internal and external customers, and to continuously provide guaranteed customer satisfaction. JMT aims to present its technological leadership and the superior quality of its products, acquired through the application of new production and service methods and continuous improvement, in international markets as well as the local market. All JMT employees take responsibility for their role in the corporate system and participate more effectively for success and progress. Based on the total quality concept, employees also have the ultimate responsibility for the continuous improvement of the quality. 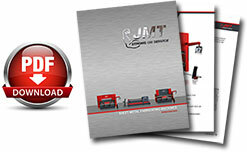 JMT is aware that the environment has to be protected from hazardous conditions. It is one of the main principles of JMT, therefore, to select materials and techniques that are appropriate for the purpose of protecting the environment. JMT makes decisions and applies procedures aimed at achieving high quality products and customer satisfaction cooperating with suppliers and dealer organization.